An A2 ESL lesson plan containing practical activities, games and resources for teaching basic quantifiers. If you're an iOS or Android user, try this lesson out on our TEFL Handbook app. It gives you offline access to all of our materials, perfect for quick reference in the classroom. 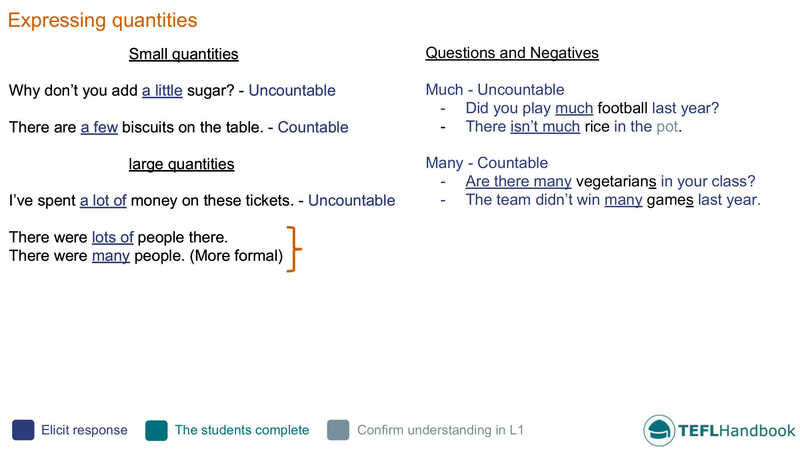 The ESL sample board for this lesson focuses on the functional uses of basic quantifiers, how they are used to imply small or large quantities along with questions and negatives. It's common for language learners at this level to have some knowledge of these quantifiers, so try to elicit as much as possible. 2. _____ miles is it to France? 5. Did you eat _____ pizza in Italy? A lot of sun cream. When they have finished, you can play a game where the groups now try to guess what the other teams packed in their bags. Student A: I think they brought a lot of sun cream. Teacher: (To student B) Did you bring a lot of sun cream? Student B: Yes, we did. We brought three bottles. After this, the students will work in pairs to write a simple recipe idea of their choosing. Teach-this.com have a list of ESL activities related to teaching Expressions of Quantity. ISLCollective have a great collection of worksheets on quantifiers. Our personal favourites, 'Quantifiers' and 'Quantifiers a lot of, many, much, a little, a few' cover everything in this lesson. The YouTube channel Learn English with Papa Teach Me has a fantastic video on quantifiers that would be a great addition to your lesson. Our suggested next lesson is on question words. Be sure to check out our full list of ESL lesson plans for intermediate students, A2 lower and A2 upper, as well as our complete selection of EFL - ESL lesson plans. If you use an iOS or Android device, have a look at the TEFL Handbook app. An ESL lesson planner for English teachers. It has a lot more content and gives you faster access to our ESL resources, making it easier to use in class.